I’ve tended to comment on current affairs on this blog, writing relatively few longer, analytical posts about issues. That’s obviously a mistake, but it’s due to the time constraints I’ve had of late, especially with my recent move to Brussels and search for an apartment (and a pretty nasty cold and fever on top of that). So I thought that I’d finally get around to doing something worthwhile: the first in a series of explanations of the American political system to both foreigners (the majority of my readers, I think) and people more generally who pay little attention to the intricacies of US politics. And what better way to start than the way America elects its presidents? Unlike most countries with presidential systems, America does not, in fact, directly elect its head of state. What? The appearance of a presidential election every four years in which Americans across the country vote would seem to suggest the contrary. Yet things are in fact far more complicated, as we saw just over ten years ago when Al Gore won half a million more votes than George W. Bush, yet lost the election to his adversary. That might sound like nonsense to most people, but it’s actually extremely logical – it just requires a basic understanding of the federal legislature. Like most modern democracies, the United States has three branches of government (legislative, executive and judicial). The legislative branch is represented by a Congress comprised of two houses – the House of Representatives and the Senate. Many other countries have bicameral systems like this one, though the US is one of the rare few to give equal powers to both houses. Under the terms of the Connecticut Compromise, the two houses were designed to represent different constituencies. One, the Senate, would give equal weight to every single state (with two senators per state), while the House would represent the people, with the number of representatives per state determined by population. Since the Reapportionment Act of 1929, there have been 435 members of the House, divided among the 50 states on the basis of the most recent census (held every ten years); since 1959, when Hawaii became a state, there have been 100 members of the Senate (once again, two per state). What this means, going back to the Constitution, is that every state has a certain number of presidential electors, based on its representation in both houses. In 2008, the most recent presidential election, California had 55 electors, because it is represented by 53 members of the House and 2 senators; Alaska, on the other hand, had 3 electors, corresponding to its sole congressperson and its two senators. These electors, who number 538 in total (435 representatives, 100 senators, and 3 electoral votes for Washington, DC, which lacks congressional representation but which has a vote in presidential elections since the ratification of the 23rd Amendment in 1961), pick the president every four years. How are these electors chosen? Well, theoretically, a state can choose to pick its electors however it likes. In 1789, the first presidential election, won by George Washington, four states allowed their state legislatures to pick electors, one left it up to the governor, while the others had some form of popular vote, either by district or state-wide. Right up until the Civil War, South Carolina still left it up to its state legislature to pick determine its electoral college vote. Looks simple, right? Just pick the presidential ticket (presidential and vice-presidential candidates) that you’d most like to see running the country for the next four years. What actually happens is somewhat different, however. 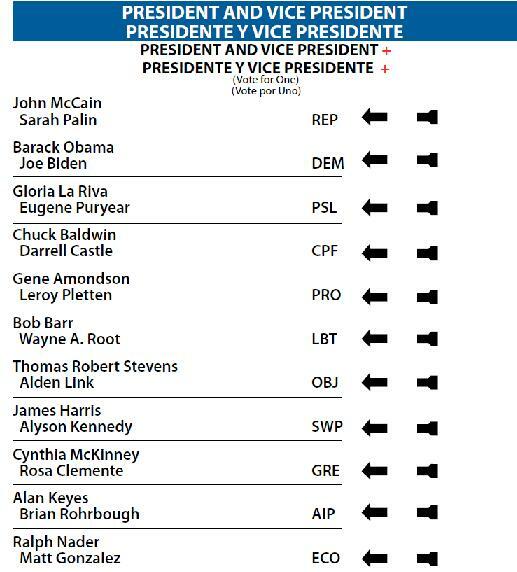 When a Floridian picks one of the duos on the ballot above, he actually chooses a list of electors picked by the campaign of the candidates in question. So, for example, Barack Obama picked 27 candidates for elector who would vote for him in the electoral college. Their names are not on the ballot, though they are publicly available. But should Obama win Florida (which he did in 2008), his 27 candidates would be chosen as Florida’s electors in the 2008 presidential election. What that means is that you effectively have 51 (50 states plus DC) separate elections, with each state choosing a ‘slate’ (list) of electors who will then vote for the president. Almost all states (Maine and Nebraska being the exceptions) attribute these electors on a ‘winner-takes-all’ basis, meaning that the ticket winning the most votes in the state wins all of the state’s electoral votes. Going back to Florida as an example, Barack Obama’s 50.92% of the vote in that state meant that he won all of the state’s 27 electoral votes, while John McCain won Missouri’s 11 electoral votes (to take another example) by beating Obama 49.43% to 49.29%. Sounds complicated, doesn’t it? Well, let’s forget the electors for a second, and just think of states representing a block of votes in the electoral college. New York is worth 31 votes, while Texas is worth 34. Barack Obama won a majority of the popular vote in New York, meaning that he won that state’s electoral votes, while John McCain won Texas and its 34 electoral college votes. Add up all of the state-wide totals, and you have the Obama-Biden ticket triumphing with 365 votes to McCain-Palin’s 173. That’s not a big deal, as long as the electoral vote winner and the popular vote winner are the same person – though Obama won nearly 68% of the electoral college votes with only 52.9% of the popular vote (the total of all of the votes cast by US citizens in the 50 states plus DC). However, the system has several inherent flaws. For one thing, because of the way electoral votes are apportioned, small states have disproportionate power compared to their population – Wyoming has roughly 188,000 residents per elector, compared to California’s 677,000. Secondly, since most states clearly favour one party or another (Minnesota last voted for a republican in 1972, while Alaska only gave its electoral college vote to a democrat once, in 1964), a few ‘swing states’ like Ohio, Florida or Colorado essentially make all of the difference. Finally, the national popular vote actually matters surprisingly little – as Al Gore found out in 2000; John Kerry, also, would have won in 2004 with a small swing in Ohio despite trailing substantially in the popular vote nationwide. What is also possible is an electoral college draw or tie, despite a popular vote win for one candidate or another. In order to win the presidency, a candidate must win the votes of a majority of electors (270, under the current rules). If no candidate reaches that number, either because there are more than two candidates winning states, or because both major candidates win 269 votes, then the House of Representatives gets to pick the president, while the Senate picks the vice-president. The Washington Times foresaw a scenario in 2008 where, because the outgoing House was in democratic hands but the Senate was evenly divided between Obama and McCain supporters (Joe Lieberman, an independent democrat, supported McCain over Obama), we could very well have seen a President Obama elected by the House and a Vice-President Palin elected by the Senate. It’s all quite fun from a political pundit’s point of view. It makes elections more interesting, reducing states to blocks of votes to be attributed en masse to one candidate or another. Election night is more fun when you’re tallying up states on a board, trying to get to the magic 270. It’s fairly nonsensical, however. Every country with a strong executive president elects its head of state by giving each citizen an equal vote. Imagine such a system in France, with each region or département having a certain number of votes in the presidential election to divvy up as it saw fit. One could argue that such a system does exist in the election of the presidency of the European Council, with each member-state given a weighted vote based partly on its population. However, we’re not talking about direct elections for the presidency of a country – picking the person that will have access to the nuclear launch codes for the next four or so years. Basically, it’s somewhat silly and out-dated, but it’s not going to change any time soon, and it doesn’t make that much of a difference, to be honest. We’ve only seen three scenarios thus far in American history (1876, 1888 and 2000) when the winner of the popular vote didn’t win the electoral college vote and become president. One more such case might be enough to force people to support changes to the system, like the National Popular Vote Interstate Compact, which would give a majority of the electoral college votes to the popular vote winner. But, for now, at least you might have a slightly better understanding of how America elects its president. Pingback: Elsewhere on the blogosphere … « Deverbalise this! Because of the state-by-state winner-take-all electoral votes laws (i.e., awarding all of a state’s electoral votes to the candidate who receives the most popular votes in each state) in 48 states, a candidate can win the Presidency without winning the most popular votes nationwide. This has occurred in 4 of the nation’s 56 (1 in 14) presidential elections. The precariousness of the current state-by-state winner-take-all system is highlighted by the fact that a shift of a handful of votes in one or two states would have elected the second-place candidate in 4 of the 13 presidential elections since World War II. Near misses are now frequently common. There have been 6 consecutive non-landslide presidential elections (1988, 1992, 1996, 2000, 2004, and 2008). 537 popular votes won Florida and the White House for Bush in 2000 despite Gore’s lead of 537,179 popular votes nationwide. A shift of 60,000 votes in Ohio in 2004 would have defeated President Bush despite his nationwide lead of 3,000,000 votes. In the 2012 election, pundits and campaign operatives already agree that only 14 states and their voters will matter under the current winner-take-all laws (i.e., awarding all of a state’s electoral votes to the candidate who receives the most popular votes in each state) used by 48 of the 50 states. Candidates will not care about 72% of the voters– voters in 19 of the 22 lowest population and medium-small states, and big states like California, Georgia, New York, and Texas. 2012 campaigning would be even more obscenely exclusive than 2008 and 2004. In 2008, candidates concentrated over 2/3rds of their campaign events and ad money in just 6 states, and 98% in just 15 states (CO, FL, IN, IA, MI, MN, MO, NV, NH, NM, NC, OH, PA, VA, and WI). Over half (57%) of the events were in just 4 states (Ohio, Florida, Pennsylvania and Virginia). Candidates have no reason to poll, visit, advertise, organize, campaign, or care about the voter concerns in the dozens of states where they are safely ahead or hopelessly behind. Voter turnout in the “battleground” states has been 67%, while turnout in the “spectator” states was 61%. Policies important to the citizens of ‘flyover’ states are not as highly prioritized as policies important to ‘battleground’ states when it comes to governing. I agree completely with the NPV bill, and I really hope it passes and is enacted in enough states to come into effect. It just makes sense. Its shelving in NY wasn’t good news, however. I can’t see it coming into effect in time for 2012, but maybe 2016, especially if the coming presidential election is close. The thing about American politics is that it’s just such a slow-moving process unless there’s some kind of unexpected shock that forces people into action. In any case, I’m with you 100% and have been for some time.